Need To Conserving Water ???? Saves 33% of water when we use the small flush button. A typical WC is flushed 5 times a day with 4 small flushes and 1 full flush: 4 x 4litre small flush, 1 x 6 litre full flush= 22 litres of water a day with an average flush of 4.4 litres. Good when used commercially as used repeatedly for large no. of times.Special single flush WC and cistern combination that only needs 4.5 litres of water to flush. SAVES 25% of water v/s 6 litre only flush. Good for areas of high usage with different users such as airports, railway stations, public places, etc. Bath designed with a larger area at the base to give space for an overhead shower.Showering is an effective way of saving water . A shower bath gives you a choice of showering or bathing where space is limited. Showering is an effective way of saving water as compared bathing with bucket. A person uses 40 lt. of water for bathing which is 30% of LPCD and amount of water used by shower depends upon type of shower ,pressure and time period the shower taken. 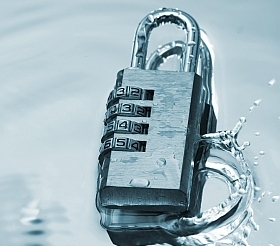 A restrictor reduces the amount of water used. The restrictor is inserted between the valve and shower kit. Showers can use anything from 10 to over 30 litres of water per minute depending on the water pressure. Shower restrictor limits the water flow to 9 litres per minute at 3 bar. A typical 7 minute shower with water restrictor can save between 40 and 80 litres of water compared to having a bath. 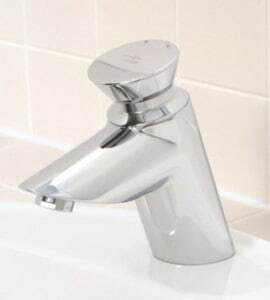 Ceramic disc taps use a very hard ceramic material in the valve. 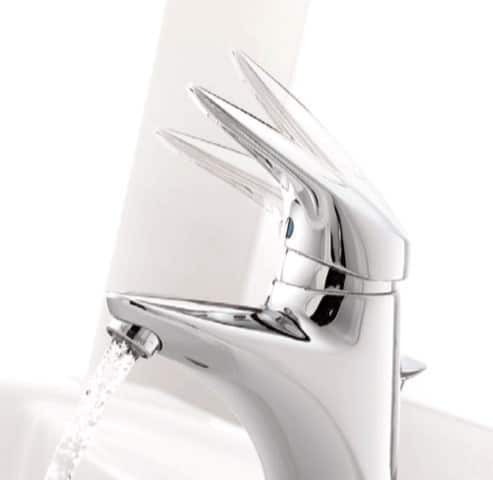 gives precise control and reduces the chance of having a dripping tap. Over time a dripping tap can waste many litres of water.A dripping tap wastes up to 4 litres of water per day. Resistance is felt in lever when the tap is delivering half the potential water flow. When lever ‘clicks’ tap delivers 100% flow. Cuts water usage by 50% if lever is stopped before click. Lever is pushed down to activate tap. Water flow automatically stops after a period of time. Run time is manually adjusted on installation – typically 10 to 15 seconds. Controlled water delivery. No risk of tap being left on resulting in flooded washroom. Integral sensor shuts off after 3 seconds from when hand is removed. Spouts with integral sensors detect hands within the sensing range and the solenoid valve is opened. The valve remains open for 3 seconds after the removal of hands and up to a maximum of 30 seconds if a hand or object is continuously detected. Infrared sensor detects user and operates Water delivered only when it is needed. Fittings can be stand alone or be part of an integrated washroom system controlled by one unit. Water delivered only when it is needed. Spouts with remote sensors operate differently. When hands are detected within close proximity of the sensor, the solenoid valve opens and water is delivered for a maximum of 30 seconds. The solenoid valve can be closed within this period by a second activation of the sensor. Reduces water to 6 litres per minute at 3 bar. Airated nozzle gives softer water feel, ideal for hand washing. Instead of WC ,WATER EFFICIENT URINALS should be used at PUBLIC PLACES like Hospitals ,Airports ,Railway Station , etc. 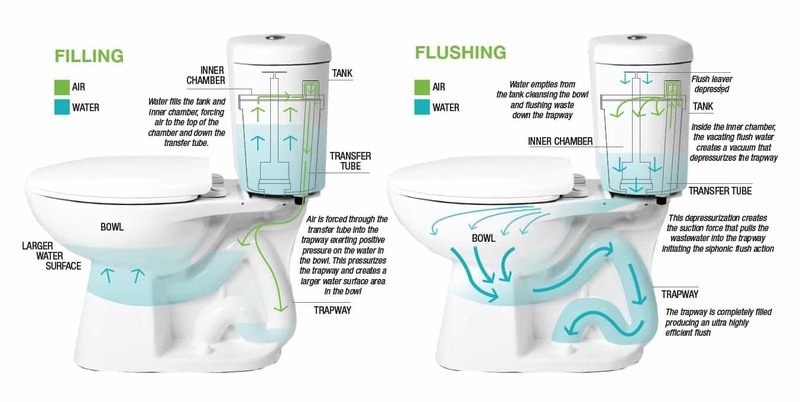 Latest technologies like SENSOR FLOW ,TIME FLUSH ,AUTOMATIC FLUSH can be used. 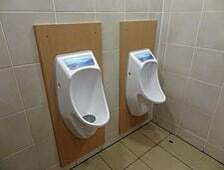 urinals that use no water at all, first invented by a German named Klaus Reichardt. Use a trap insert filled with a sealant liquid instead of water. The lighter-than-water sealant floats on top of the urine collected in the U-bend, preventing odours from being released into the air. the cartridge and sealant must be periodically replaced. the system saves anywhere between 15,000 and 45,000 gallons (approx. 55,000 and 170,000 litres) of water per urinal per year.